Coach Springer presents these scoring drills used by Kevin Durant - NBA All-Star and Rookie of the Year, and former College Player of the Year. 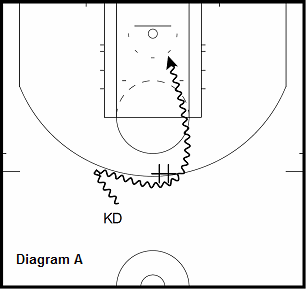 Diagram A. KD receives a lot of ball screens...as any good scorer should. He likes to take advantage of help defender by using his length to attack them. Drill: Set up screen and attack chair (#) to score 15 times in help attack, runner in the lane, and pull up jump shot at the nail. Do to both sides. 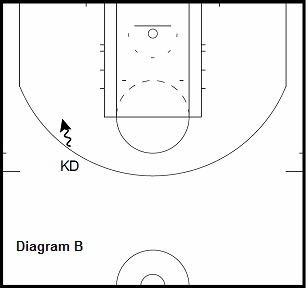 Diagram B. Durant will give multiple crossovers stationary to set up the defender. He then transitions to a quick between the legs move that sells the go but pulls up into jump shot (freeze pull up). Durant uses two steps out of the between the legs move to sell the go. Drill: Use 3 change of directions stationary into a quick between the legs and freeze pull-up. Make 15 going towards the baseline and 15 towards the elbow on both sides of the court. Diagram C. KD's ball handling abilities allow him to attack defenders frequently. 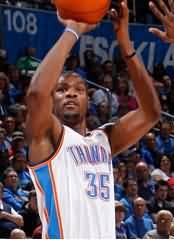 After beating the initial defender KD will hesitate at the free throw line to assess the help defenders reactions. From there he will either attack the basket, shoot a runner in the lane or make a pull up jump shot. Drill. Attack cone with a change of direction and get to the free throw line with explosiveness. Hesitate and make 15 lay-ups, runners and jump shots. Do on both sides of the court. 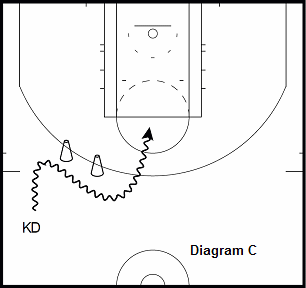 Diagram D. Oklahoma uses a great play to get KD the ball while opening up the ball handler. KD screens the ball with a sideline and pops to the wing. His shooting range gives him the option to catch and shoot or drive to the basket. Drill: Screen the chair (#), and pop for 15 makes with catch and shoot. Also make 15 one dribble jump shots with same drill. Do on both sides of the court. 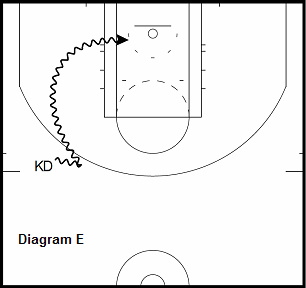 Diagram E. Durant's ability to change directions quickly is one of the best in the league. He sometimes likes to take a couple of dribble drags towards the top of the key. As soon as he gets a shift from the defender he quickly crosses back over and drives the baseline. 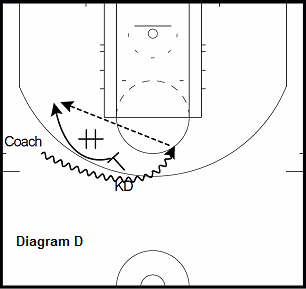 Drill: Use same move to make 20 makes with runners on both sides of the court. 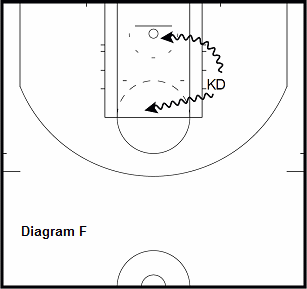 Diagram F. By taking advantage of his 6'9" frame KD will post up smaller defenders near the mid post. This makes him dangerous because he now can use a post game but is far away enough to square up and attack. Drill: Post up in mid post area and make 25 with all scoring moves. Do on both sides of the court. Diagram G. With Kevin being a great shooter, it only makes sense to have him catch and shoot off of down screens. 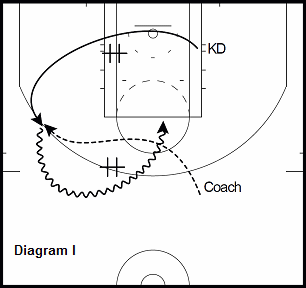 Drill: Make 25 with catch and shoot and 25 with the counter. 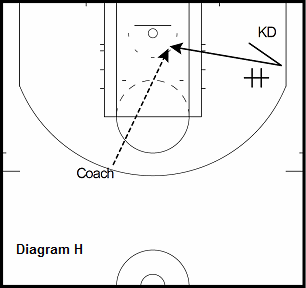 Diagram H. When the defense over plays the down screen, KD will back-door cut for the alley oop. Diagram I. KD receives a screen, flashing from the opposite block to catch on the wing. From there he receives a ball screen. Drill: Go through the play to make 25 jump shots from the nail. Diagram J. 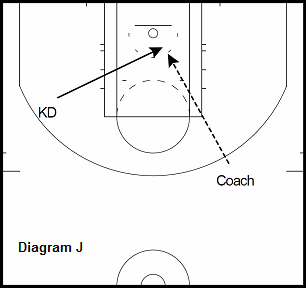 To create quick offense, KD will duck in to the help line early in offense for a quick turn around and score. 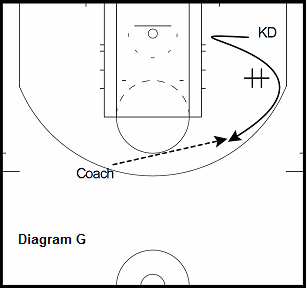 Drill: Make 25 from duck in position diving to the paint from both sides of the court.